Nigel Farage has been accused of attempts to "whip up division" with a poster suggesting that migrants had pushed Britain to "breaking point". 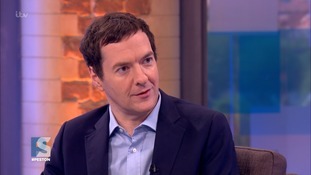 Chancellor George Osborne branded the pro-Brexit advert as "disgusting and vile" and said it had "echoes" of Nazi propaganda dating from the 1930s in an appearance on Peston on Sunday. Meanwhile the Eurosceptic MP Michael Gove said he "shuddered" when he saw the poster, which shows a crowd of refugees and migrants waiting at the Slovenian border. The image has been reported to the police for alleged racism, while some commentors on social media have compared its message to Nazi propaganda. Mr Farage has hit back at accusations of racism, insisting that the poster was an an "accurate, undoctored" picture showing the strains facing Europe. Today Mr Osborne said there it was "perfectly legitimate" to raise concerns over migration, but the message given out by Farage had crossed a line. I think there is a difference between addressing those concerns in a reasonable way and whipping up concerns, whipping up division, making baseless assertions that millions of people are going to come into the country in the next couple of years from Turkey, saying that dead bodies are going to wash up on the beaches of Kent, or indeed putting up that disgusting and vile poster that Nigel Farage did, which had echoes of literature used in the 1930s. 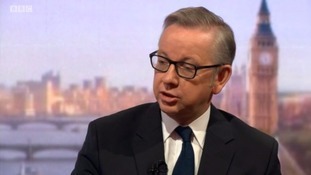 His comments came shortly after pro-Brexiteer Michael Gove also expressed discomfort over the image in an appearance on the Andrew Marr Show. "When I saw that poster I shuddered. I thought it was the wrong thing to do," he said. Mr Farage himself has said the poster was an "accurate, undoctored" picture of the consequences of German Chancellor Angela Merkel's decisin to open the doors to refugees from the Syrian war. He also Sky's Dermot Murnaghan: "That poster reflects the truth of what's going on, there's a new poster coming out tomorrow morning. Nigel Farage accused the Prime Minister of linking the motives of the MP's alleged killer to the Leave camp and said "frankly that's wrong."